Welcome to day #3 of BOGO Week! All week long, you can snag special Buy One Get One Free deals from doTERRA! There will be one deal each day (Monday–Friday). Each deal will be available until midnight. You can order up to 5 BOGO specials per account. BOGO orders may be LRP or standard orders. Simply add the product to your cart and the freebie will automatically be added. Or use the SKU #. PRO TIP: Get together with 4 local friends and order BOGOs together to save on shipping! Buy 1 Melaleuca, get 1 Marjoram for free! That’s two amazing oils for just $19.00 wholesale. This offer will be available until midnight tonight! We’ll be posting here each day of the week to let you know what product is being offered FOR BOGO FREE and tips and usage suggestions! To order, login to mydoterra.com with your ID#/password and add the BOGO item to you cart. The FREE ITEM will automatically be added. BONUS: Shipping costs are now lower than ever! >>> MELALEUCA OIL is more commonly known as “Tea Tree.” Melaleuca is best known for its purifying properties. It can be used to cleanse and purify the skin and nails and to support a healthy complexion. Taken internally, Melaleuca promotes healthy immune function*, and Melaleuca can be used on surfaces throughout the home to protect against environmental threats. Melaleuca is frequently used on occasional skin irritations to soothe the skin and diffusing Melaleuca will help purify and freshen the air. • For occasional skin irritations, apply 1–2 drops of Melaleuca essential oil onto affected area. • Combine 1–2 drops with your facial cleanser for added cleansing properties, or apply to skin after shaving. • Apply to fingernails and toenails after showering to purify and keeps nails looking healthy. • Add a few drops to a spray bottle with water and use on surfaces to protect against environmental threats. 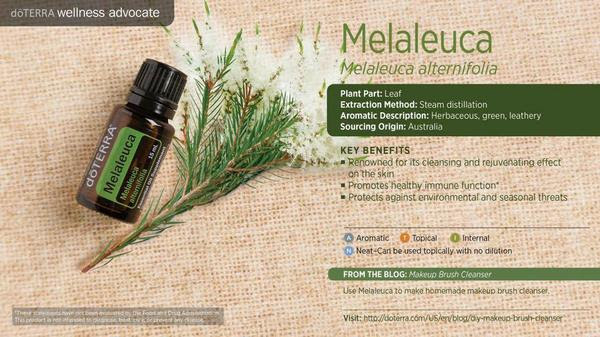 I personally use melaleuca a TON! It’s wonderful for cleansing skin or wounds, DIY cleaning products, boosting immune systems, etc! >>> MARJORAM OIL is valued for its calming properties and its positive effect on the nervous system. It also supports both healthy cardiovascular and immune systems. • Apply to a fussy child’s feet prior to a nap. 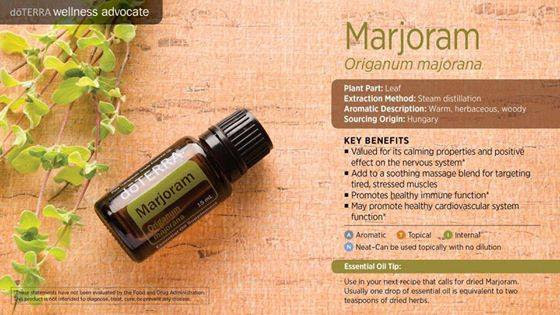 • Replace Marjoram essential oil in your next recipe that calls for dried Marjoram. Usually 1 drop of essential oil is equivalent to 2 tsp. of dried herbs. •Apply to muscles before and after exercising. I rarely have fresh marjoram herb, so I rely on the essential oil in my cooking. It’s also one I reach for for muscle cramps or sore muscles.